Los Angeles – The price of Gold rose last week gaining 0.12 percent to $1,418.70 an ounce for the week, on higher crude oil prices and escalating anti-government unrest in the Middle East and North Africa, including the no-fly zone imposed on Libya. The price of silver dropped 1.70 percent to end the week at $35.24 an ounce while the Gold/Silver ratio rose to 39.64, as silver under-performed gold. In Japan, the Fukushima Dai-Ichi atomic power plant continued to move in the direction of a full blown meltdown all week as Americans within 50 miles of the reactors were told by the U.S. State Department to leave the area. Reports suggest that workers at the disabled power plant were finally successful in connecting a 0.6-mile long power cable from the main grid to restart water pumps for reactor cooling. The damaged nuclear reactors at the Fukushima nuclear plant have left the country facing a huge energy shortage that must be made up with crude oil and LNG. A smaller amount of crude oil will be needed to power the country during the initial recovery period, increasing over time as repairs are made to Japan’s damaged infrastructure. In the Middle East and North Africa, Bahrain declared a three month state of emergency as anti-government protesters have become increasingly more violent. Tensions in the region have helped to push the price of gold to a new all time record of $1,445.70 an ounce just two weeks ago. Saudi Arabia, in an effort to help quell anti-government protests in neighboring Bahrain, has deployed more than 1,000 Saudi troops, joining 500 police officers already sent by the United Arab Emirates, to aid in their security. The Saudi’s latest move is part of a stepped up Gulf Cooperation Council effort to reinforce the Bahrain governments security forces which have been tested by unrest over the past several weeks. Iran expressed its displeasure at the arrival of Saudi troops in Bahrain, the home of the U.S. Fifth Fleet, calling the move unacceptable and urging the kingdom to respond peacefully to the demonstrators and to do it without foreign intervention. In Libya, the Arab League’s support of the no-fly zone was seen as essential to its implementation, as they called on Western forces for assistance. Now after two days of intense attacks on Libyan installations, the Arab League is having second thoughts, with many of its 22 members threatening to change their vote. Allied officials said air and missile strikes by U.S., U.K., and French forces have done exactly what was needed and grounded Muammar Gaddafi’s air force. 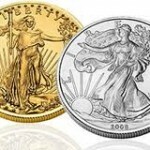 Gold bullion prices jumped after U.N. forces attacked military targets in Libya.